Surrounded by mountains, this recently renovated Pueblo Encantado unit is located in prestigious Tesuque, just 8 miles from the Santa Fe plaza and close to the new 5-star Four Seasons resort, Rancho Encantado. Full of color and Southwest art, this beautiful unit provides space, quiet, comfort, and style, plus every amenity you'll need for a fabulous Santa Fe vacation. Enjoy mountain views with your morning coffee on the front patio filled with flowers. A pool is just around the corner, and the unit features wi-fi plus flat screen televisions, a Bose sound system with CD/DVD player, a fireplace in the living room and master bedroom, new carpets and furniture, new appliances in the kitchen, washer and dryer. The master bedroom has a king bed and fireplace, the second bedroom can be made with either two twin beds or one king. Both bedrooms have marble or granite bathrooms. Both bathrooms are newly renovated with Kohler fixtures. The master bath is marble-tiled and the second bathroom has granite tile. Also a complete Pack n' Play set for babies, and an Aero bed is provided for an extra guest. Wonderful condo in a great spot! the village of Tesuque. Easy to get to Santa Fe, Taos and Bandelier National Monument, this is a perfect location, outside the city in a quiet spot. The condo itself is perfect, beautifully decorated and well kept, the amenities are top notch. The owner, Ann, was immediately responsive to our questions, and thoughtfully left us lots of information on the area. We had a wonderful week --- and would highly recommend this stylish mountain retreat. We loved the Condo and the area. The Condo was comfortable and well equipped. It was in a perfect location north of Santa Fe a few miles. Easy to get to all the area attractions. A lovely place in the mountains close to the Santa Fe opera. The house is well done, quiet, has a small but peaceful courtyard with lots of birds. A great place to relax and enjoy the air. My mother and I enjoyed staying here so much. The place is clean, cool, quiet comfortable and adorable. It’s a 15 minute drive or less to anything I could need and a very reasonable $18 Lyft to the Indian art fair. I loved the homeowners sense of color and the place is decorated beautifully with a touch of humor. Mom and I made use of the kitchen everything we needed was there. I hit the pool at the end of a long day in the sun and it was heavenly. Hostess was super sweet and responded to me immediately with everything. If I could give this 10 stars I would do so. Our family of 4 loved this beautiful property! This condo is clean & very cozy!! All the bed were comfortable with soft sheets. The property owner, Ann is wonderful. She answers all questions promptly & has a nice binder full of information about Santa Fe. Lastly, we enjoyed the community pool & ping pong table. Very relaxing stay and we always enjoy our time at Pueblo Encantado. 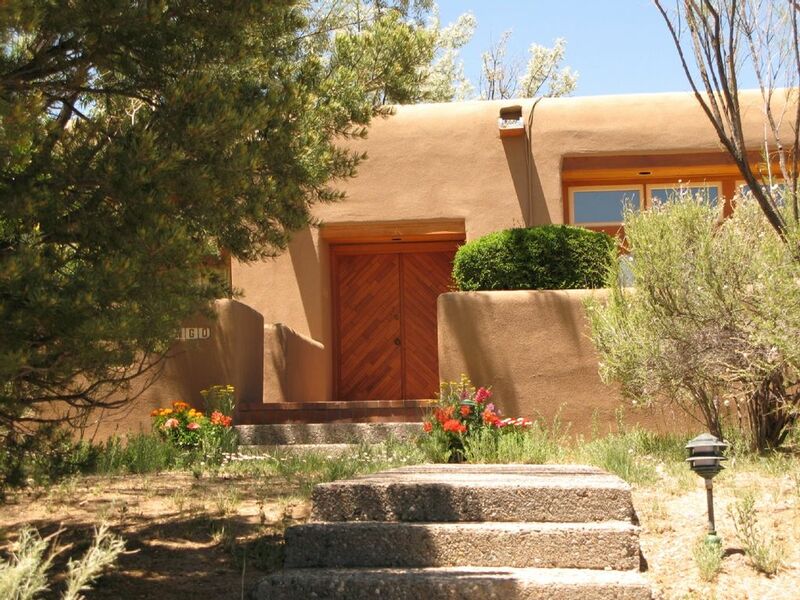 Ann is an excellent host and staying out in Tesuque is ideal for either going to town or heading north to Taos. We have stayed at this property on three seperate visits and will certainly return. Santa Fe is known for its wonderful sunny weather, its mountain scenery and sports, its Hispanic, Indian, and cowboy heritage, and its outstanding shopping. In the summer there are five golf courses plus the famous Indian market, Spanish market, the folk arts market, opera, and chamber music. In the fall, the Aspen trees turn a beautiful gold and there's great hiking plus many cultural activities. In the winter there's skiing just a half hour away, and a fabulous holiday season. All year round, Santa Fe boasts the second largest art market in the US and one of the best flea markets anywhere. The restaurants are famous for good food and the nightlife adds lively music to the scene. Cancellation policy: If you cancel the reservation any time up to a week before the arrival date, you will lose 50% of the total rental fees (not including the security deposit or cleaning fees). If you cancel the reservation one week or less before the arrival date, you will lose 100% of the rental fees. Damage deposit: The security deposit will be returned as soon as we inspect the property after the rental period and assuming no damage. Charges for damage will be itemized and deducted from the security deposit. The cleaning charge assumes that it will take the housekeepers 6 hours to clean the condo. If the condo requires more than 6 hours of cleaning, then the additional hours at $25 per hour (or pro-rated portion) will be deducted from the damage deposit. No smoking: This is a no smoking unit; if there is evidence of smoking after you leave, you will forfeit the entire security deposit. No pets: No pets of any kind are permitted in the unit.